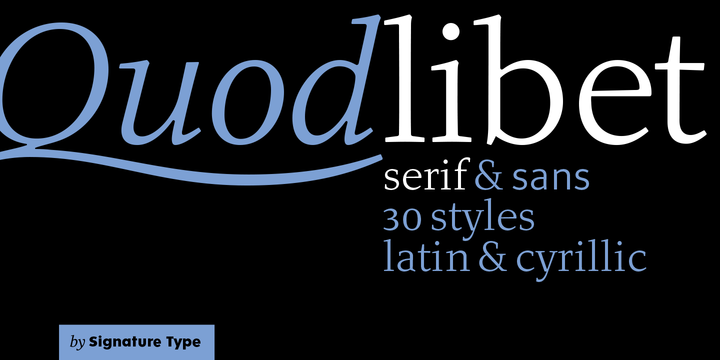 Quodlibet Serif is a typeface created by Tomáš Nedoma together with Rostislav Vanek and published by Signature Type Foundry which was inslired by the legibility of renaissance and Baroque Antiqua. This font family features ink traps designed as unusual style forming elements, yet suppoting crisp edges in small sizes. Pay attention to details, specialy readable in larger sizes and advanced language support. Have fun! Price: starting from $43,00 for one font to $306,00 for all 14 fonts. A font description published on Tuesday, September 15th, 2015 in Fonts, Rostislav Vanek, Signature Type Foundry, Tomáš Nedoma by Alexandra that has 4,685 views.